Swimming in clouds, originally uploaded by The Bacher Family. I spent four days in Crescent City, California while attending training at Redwood National Park. My final evening, I took a walk along the waterfront, enjoying a magnificent sunset. 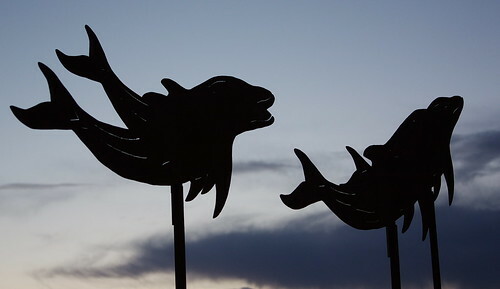 I couldn't resist photographing this piece of artwork among the docks; from the right angle, it lookeds like the whales are swimming through the evening sky!